Solving issues for public utilities, their customers and competitors. Calfee’s Public Utility, Energy and Telecommunications Litigation practice group – exclusively focused on the unique issues faced by public utilities, their customers, and market competitors – is a rarity in Ohio. Calfee has been involved in almost every recent significant utility case in Ohio. There is a reason our clients have trusted us with their multi-billion-dollar litigation. Calfee’s Public Utility, Energy and Telecommunications Litigation group recognizes that public utility litigation is unique. Public utility litigation involves all of the issues of traditional litigation, demanding counsel with experience in litigating major cases. However, utility litigation also involves a host of interactions with governmental authorities, a significant factor that is not present in traditional litigation. Utilities must also be conscious of the potential impact litigation may have on PUCO staff, the Power Siting Board, local governments, and potential General Assembly involvement. Calfee’s knowledge and expertise in this area allow us to be a full-service provider, structured and operated in a manner that recognizes that utility issues significantly impact the public and, therefore, have fundamental governmental implications. We represent one of the nation’s largest electric utilities, the nation’s largest transportation network company/ride sharing application, Ohio’s largest municipal electric utility, a major competitive retail electric service provider (CRES), as well as electric cooperatives, municipal water and sewer utilities, four natural gas distribution utilities, intrastate natural gas pipelines, local telephone and cellular telecommunications carriers, brokers, and select industrial customers. Our attorneys operate in concert with the firm’s Government Relations and Legislation group. This team approach allows us to achieve timely results that meet our clients’ immediate, strategic and long-term needs. We recognize that our clients’ issues are best served when regulators, customer advocates, elected officials and their staffs are fully informed. Accordingly, we make our clients’ views and concerns known to and understood by regulatory and elected decision makers at all levels through both formal advocacy and lobbying efforts. We use our broad governmental, financial, corporate, litigation and public law experience to provide innovative, business-oriented solutions to the complex issues that our clients must confront in a time of unprecedented competition and deregulation. 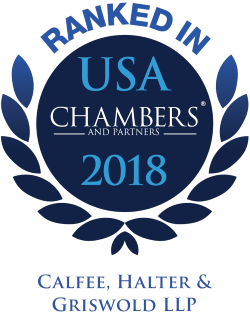 Calfee was selected for inclusion in the 2019 "Best Law Firms" rankings by U.S.News –Best Lawyers in America in Regulatory Enforcement (SEC, Telecom, Energy) Litigation (National and Metropolitan Cleveland rankings). Representing electric utility seeking PUCO approval of multi-billion-dollar electric security plan under R.C. 4928.143 or market rate offer under R.C. 4928.142. Representing electric utility in PUCO proceedings seeking approval of $250 million Energy Efficiency and Peak Demand Reduction Portfolio Plans mandated by Ohio law. Representing a municipal electric utility in a $128 million class action alleging improper billing practices. Representing competitive retail electric service provider in proceedings at the PUCO challenging terms of electric utilities’ electric security plans and contesting an electric utility’s need to construct a solar facility to satisfy alternative energy portfolio standards. Defending natural gas utility before PUCO and in state court against claims involving rates and service issues. Representing utility customers in the drafting and negotiation of power purchase agreements, including solar power purchase agreements. This representation has included negotiations regarding distribution improvements needed for major projects, integrating distributed generation resources, and assisting energy brokers in negotiating with the CRES provider. Representing municipalities in Electric Security Plan proceedings and base distribution rate cases initiated by electric utilities. Representing an international automotive manufacturer in PUCO proceedings relating to distribution network adequacy and rate structure. Assistance in the drafting of legislation authorizing securitization of utility regulatory assets, and representation in PUCO proceeding authorizing an electric utility to securitize its regulatory assets. Representing national environmental organization before Ohio Power Siting Board regarding the construction of a natural gas-fired power station adjacent to wetlands. Representing Ohio municipality before Ohio Power Siting Board regarding the construction of a natural gas pipeline in the municipality. Obtaining summary judgment against a municipal utility attempting to force a non-municipal resident to accept service under Ohio’s constitutional home rule provisions and Certified Territory Act. Representation and counseling of acquired and acquiring companies in merger approval proceedings before the Public Utilities Commission of Ohio. After extensive hearings and negotiations, the mergers were approved pursuant to commission-approved stipulation and recommendations. The stipulations represented consensus built among consumer, competitor and governmental groups. Representation of utility clients before city councils and planning agencies and providing advice and counsel in respect to use of city rights of way. Taking a collaborative approach where possible, we have been able to obtain ordinances that permit our clients to provide their necessary services without unreasonable regulation or interference. Representing the world’s leading transportation network company in Ohio PUCO proceedings. Representation of utility clients in Public Utility Commission rule-making proceedings. Such proceedings included the Minimum Telephone Service Standard, Telephone Utility Local Service Guide Line and Electric Transition Plan rule-making proceedings. Representing municipal governmental aggregation communities involving over 1 million customers. Representation of cellular carriers before municipal governments on tower siting and zoning matters.